Friday June 10th 1921 Hattie and I did a big washing and ironing. I did not quit till 6 oclock. She had some supper and went to Cedar Rapids with Rob to meet Cora. They got back about nine oclock. I was ready for bed [illeg] Letter from Aunt Sarah. Saturday June 11th 1921 I went to town with Rob to get things for the supper tonight. Hattie had Mrs Williams cleaning her part of the house till noon. The girls helped me to get supper ready in my dining room. I had the Woolfs, Ott, Fannie, and the boys, Jennie Shuck & Tishie, Rob & Cora arranged to be here at supper time. They stayed after supper. It was eleven oclock when Hattie and I finished dishes. letter from Jen Woolf. 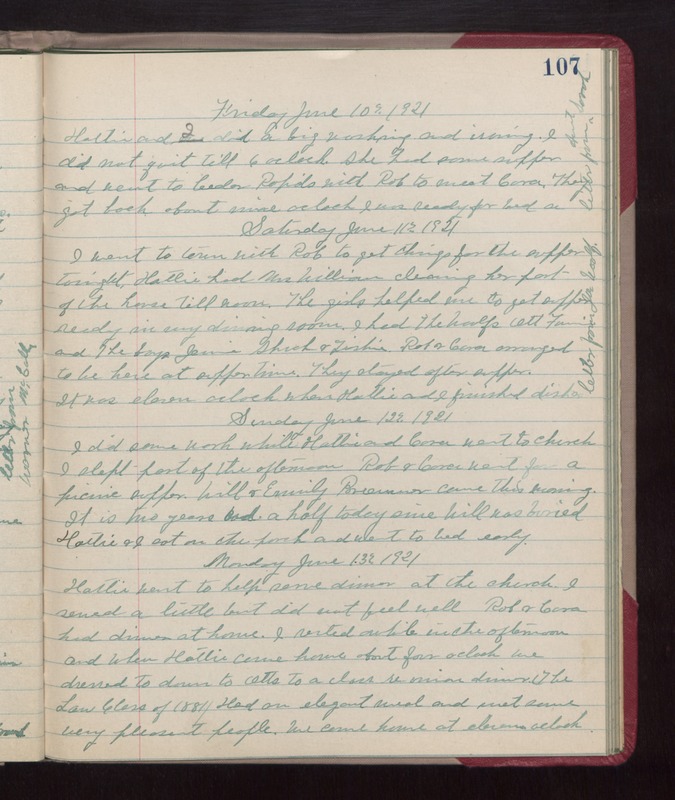 Sunday June 12th 1921 I did some work while Hattie and Cora went to church. I slept part of the afternoon. Rob & Cora went for a picnic supper. Will & Emily Bremner came this morning. It is two years and a half since Will was buried. Hattie & I sat on the porch and went to bed early. Monday June 13th 1921 Hattie went to help serve dinner at the church. I sewed a little but did not feel well. Rob & Cora had dinner at home. I rested awhile in the afternoon and when Hattie came home about four oclock we dressed to down to Otts to a class reunion dinner. The Law Class of 1881. Had an elegant meal and met some very pleasant people. We came home at eleven oclock.